How to Eat Chocolate and Keep Skin Clear! For those with acne, there are certain foods we have been warned to stay away from since our teen years to avoid making the problem worse. The main culprits on the list are usually dairy, greasy foods, like pizza and fries, and sugary foods, including chocolate. At the same time, we have learned over the years that certain types of chocolate have a number of health benefits, so how true is the myth that your candy bar is causing your acne? With the holiday season in full swing, temptation in the form of sugary sweets can be found just about anywhere. Just because you have acne does not mean you have to miss out on all the fun. First things first, it is important to understand that no single food is the cause of acne. Acne is the result of a hormonal imbalance occurring within the body and certain foods can affect the rate at which certain hormones are produced and/or affect different organs. Therefore, it is logical to deduce that what you eat can exacerbate acne, and this includes sugary foods and certain chocolates. 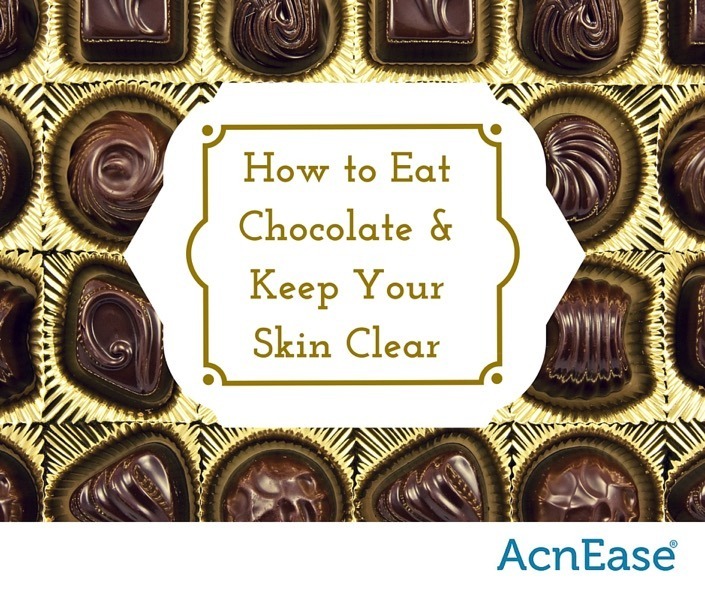 Before you decide to give up chocolate to achieve healthier skin, it is important to understand the connection between chocolate and acne. Chocolate does not actually cause acne, though the high sugar content found in certain chocolate treats can make breakouts more aggressive and can age your skin faster through the process of glycation. Many store-bought sweet treats are highly processed to lower production costs and ensure a longer shelf life. They are often loaded with large amounts of sugar, or even worse, corn syrup, as well as many other chemicals that are indigestible and cause damage to our bodies. These foods, known as high GI foods for their score on the glycemic index, are absorbed into the bloodstream very quickly. This is believed to affect hormone levels such as insulin, which can trigger the sebaceous glands to produce more sebum, the oily substance that can clog pores and contribute to acne breakouts. Dairy found in milk chocolate can also lead to changes in our metabolism if the processed milk is loaded with extra hormones. As a rule of thumb, common sweets to steer clear of include cakes, cookies, candies and ice creams that are made with artificial additives and sweeteners, and chocolates or treats that contain chocolate with a high sugar content. White chocolate, which is made almost entirely of sugar and milk solids, is one treat to keep out of the kitchen if you are acne-prone. On the other hand, we are lucky to have a delicious cocoa-bean product rich with health benefits called dark chocolate. Dark chocolate contains 60% or more of cocoa solids with little or no added sweeteners. Full of antioxidants, dark chocolate has been widely celebrated for its ability to reduce blood pressure and decrease the risk of heart attacks. The flavonoids found in chocolate have been known to increase the production of nitric oxide, which helps to moderate insulin sensitivity, keeping sugar levels in check. Dark chocolate can even contribute to lowered stress levels, a function of the body directly related to acne, as adrenaline has been known to affect the sebum-producing sebaceous glands. Dark chocolate is also much more filling than its milky counterpart, and a taste of it can lessen cravings for other sweet, or even salty, snacks. Pure dark chocolate (80% and up) is even recommended to heart patients and those with depression. So – there is clearly a way to eat chocolate while maintaining clear skin. The only thing you need to do is look for a healthy alternative to satisfy your chocolate cravings. Fruit is a healthy and creative way to satisfy your sweet tooth while taking the natural route. Dark chocolate-covered dried blueberries or cherries can provide the body with a double dose of antioxidants and are great for snacking on the go. And remember - when shopping for sweets, look for foods sweetened with honey or agave (over sugar – and no corn syrup!). Acne begins from within and what we choose to put in our bodies can directly affect what appears on the surface of the skin. In addition to treating yourself with healthy food choices, a systemic acne treatment can work 24/7 from the inside out, in case you find yourself tempted to enjoy a sugary sweet this holiday season. 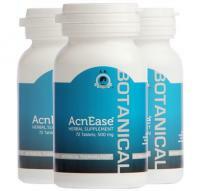 AcnEase® works as a buffer between the hormones and sebaceous glands to moderate the impact of hormones on sebum production. By targeting the problem directly at the source without affecting actual hormone levels, it is safe for use among people of all ages. Comprised of all-natural herbal ingredients, AcnEase® works from within to prevent new breakouts from forming while treating existing breakouts on the surface. This holiday season, why not treat yourself to the sweet victory of acne-free skin with AcnEase® if you haven’t already? We want to hear from you! What are your favorite sweets? Have any great dark chocolate recipes? Tell us in the comments below!